With “Ouroboros,” we’re just starting to put together some of the pieces of Teen Wolf’s Season 5 mystery. It’s a slow process that leaves us scared and confused, like the chimera creations of the Dread Doctors. Dr. Deaton, who took off to find answers in “Condition Terminal,” seems to be having better luck than us in figuring out what’s going on, and somehow the Desert Wolf is bound to play a part. Scott is desperate to rescue his friends, well Liam anyways, giving Theo a chance to play the part of the hero and strengthen his connection to the pack. While everything is falling apart, Sheriff Stalinski has decided to play good cop, much to the annoyance of the other adults in the supernatural secret club. “Ouroboros” gives us little respite from the Teen Wolf death count, but the good news is that the people we actually care about, and Hayden, survive. You’d think MTV would be hip enough to have moved past on-screen hashtags already, as they’ve become ubiquitous in television. The Teen Wolf hashtags this season haven’t been particularly clever, so we’re guessing that the job gets farmed out to MTV’s social media team. But hey, if hashtags allow us to better express groupthink–we’re all for them. Oh the places Dr. Deaton will go! Dr. Deaton is checking out a plant of some kind that was closed down, officially due to nuclear radiation, but unofficially because of faceless men in masks, presumably the Dread Doctors. 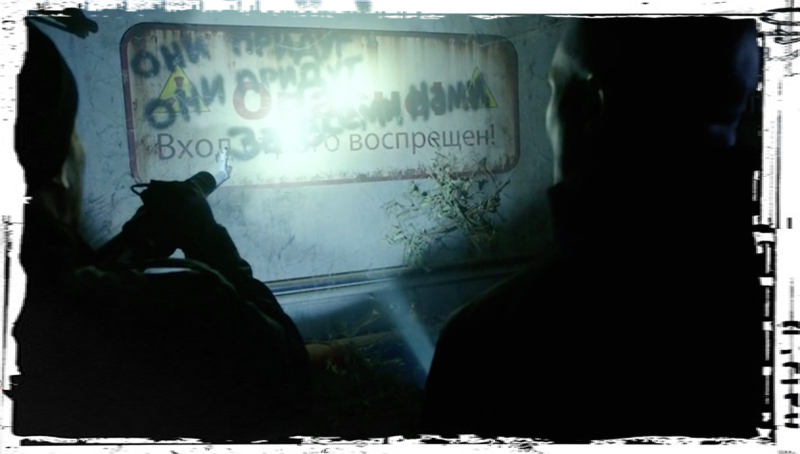 The plant, which appears to be Russian, has signs warning of radiation, but scribbled over a sign is the caution, “They come. 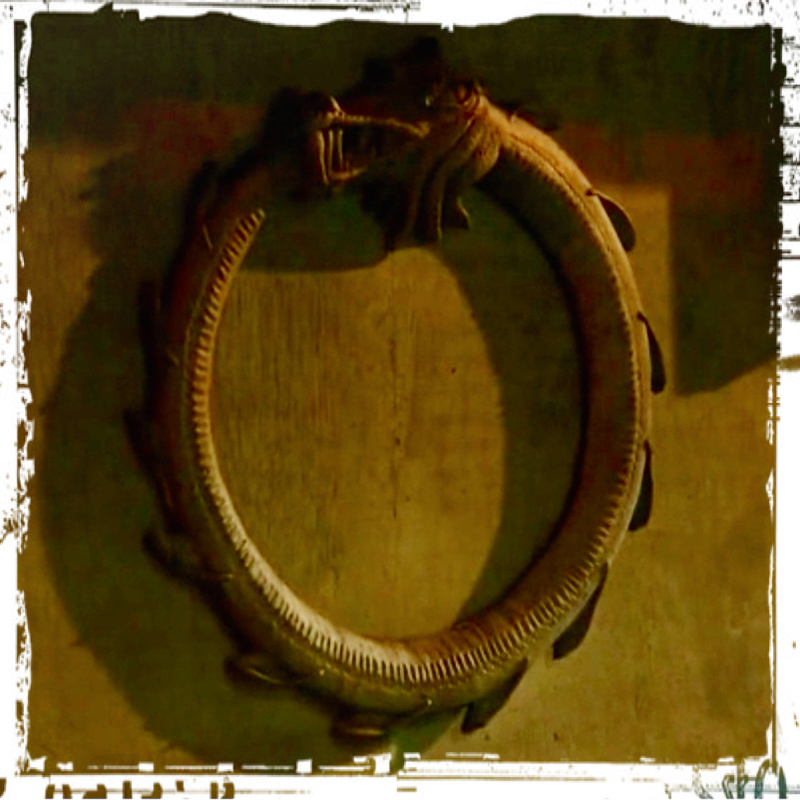 They come for all of us.” On the wall is the Dread Doctors’ gang sign, an ouroboros, a Greek symbol depicting a serpent or dragon eating its own tail. The Dread Doctors have left their horrible failed fetal experiments behind, as well as a big scary tooth that provides Dr. Deaton with an answer he’s been looking for. We’re hoping he’ll share some answers with us, but before Dr. Deaton can unlock any of the mysteries of the Dread Doctors the Desert Wolf appears. 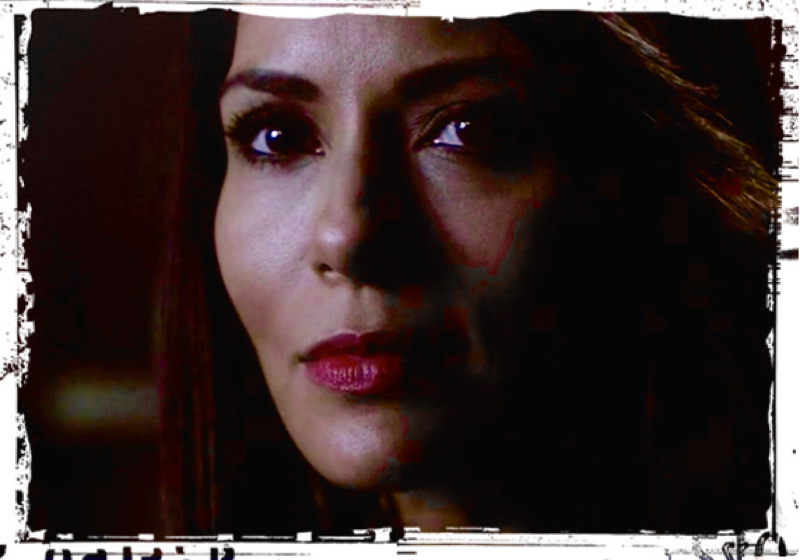 Back in Beacon Hills, Mrs. McCall invites Sheriff Stalinski over, asking him to leave his badge at the door. Despite this she invites him in and shows him the dead body in her kitchen impaled with Kira’s sword. Despite her request, the Sheriff reports the death to dispatch. Mrs. McCall expresses her feelings by slapping him. Whoa! #SlappedByMelissa. He tells her that he has a responsibility to uphold the law, but she’s not buying it. It seems like our favorite Beacon Hills couple is breaking up. Sure they had fun illegally obtaining medical records and finding clues together in “Strange Frequencies,” but now Sheriff Stalinski has decided to ruin things by going straight. Hayden’s sister, or should we say Deputy Hayden’s Sister, finds Kira wandering down an empty highway. Kira thinks she came to the highway in the middle of the night in order to remember… something. Deputy Hayden’s Sister tricks Kira into her car by acting all sweet and kind, only to handcuff her and refer to her as a suspect. Stiles and Theo, still recovering from the body snatching fire at the animal clinic, hear over the police scanner that Kira is being brought in for muuurder. Well, technically homicide, but whatevs, it’s still bad news. After Kira is brought to the station, her father comes in and confesses to killing the girl in order to protect his daughter. The Sheriff asks if he’s sure he wants to go with that story, and Mrs. Yukimura asks the Sheriff, “Are you prepared to tell a different one?” Don’t mess with Mama Kitsune. Scott has been searching for Liam and Hayden. Well, he’s been looking for Liam anyways, who happens to be with Hayden. He takes a break from his hunt to comfort his kitsune girlfriend. Though he’s not much of a comfort, ultimately, because he seems uncertain about Kira’s claim that she didn’t muuurder anybody. Probably he doesn’t think Kira did it, but he may suspect the huge glowing fox spirit that lives inside her. At their creepy lab, the Dread Doctors continue to experiment on Hayden without any kind of informed consent. Her condition is worsening. Liam is chained to the floor, where he has to watch his crush receive horrific treatments. 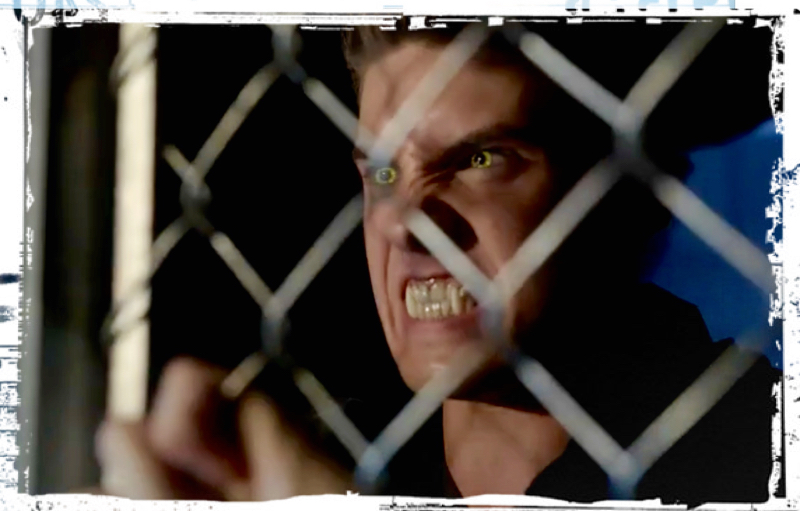 Liam growls with his wolf teeth, resulting in a kick in the face from a Dread Doctor. Later, they throw Hayden on the floor next to Liam. Liam tries to take away her pain with his werewolf powers, as he has seen Scott do, but he fails. So instead they look at each other and hold hands until they pass out. Though it’s not exactly #PuppyLove, Liam and Hayden try to find comfort in a situation of terrifying horror. Things are looking pretty grim at the Clinic of Horrors. Scott is desperate to find Liam. 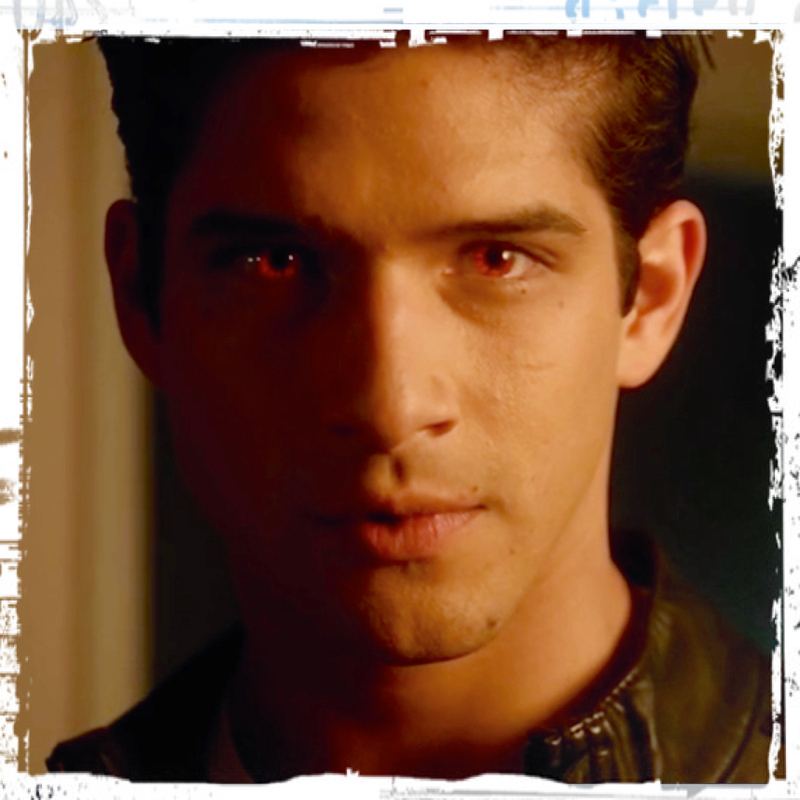 After leaving Kira at the police station, he arrives home to find Malia, Lydia, Mason, Theo, and the recently identified chimera Corey. Corey is trying to read The Dread Doctors but he’s a slow reader. This isn’t surprising in Beacon Hills, where all the kids are practically illiterate. Scott can’t wait for Corey to finish reading the book, and neither can we, so he uses his claws to #TapThatNeck in order to reach directly into Corey’s memories. There was no informed consent here either, and his friends, and frenemy, stand by shocked. Through the memory invasion, he is able to see where the D.D. took Corey and he and Stiles are able to identify it as the water treatment plant. Scott, Malia, and Mason leave for the water treatment plant, while Stiles goes to the hospital to protect his dad from the body snatcher. Malia suggests that Theo join them, but he declines, staying back with Lydia, supposedly to protect Corey from his buddies the Dread Doctors. We suspect ulterior motives, because evil Theo always has an angle. After Scott and the others leave Theo pushes Corey to try to remember anything else. He seems so genuine sometimes, it’s very confusing. Teen Wolf could at least play evil music when he’s on screen so we would know how we’re supposed to feel. 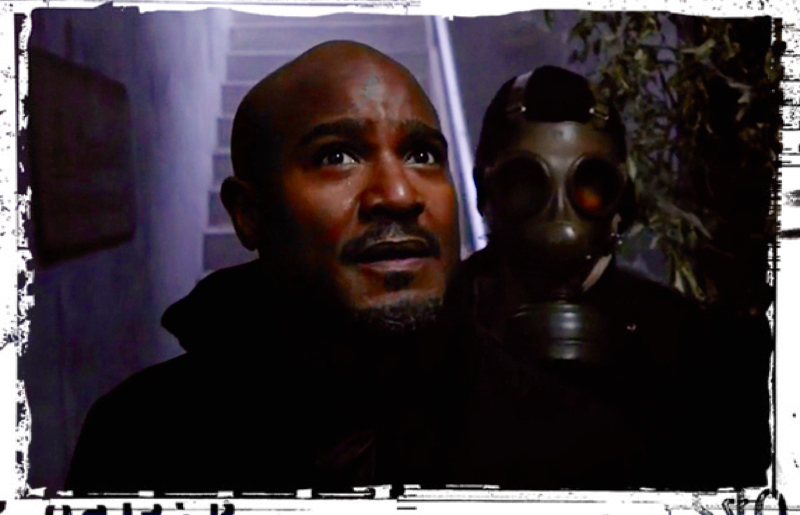 From what Corey remembers Theo deduces, or pretends to deduce since he already knows, where the Dread Doctors are holding Liam and Hayden. He takes off to reprise his role of hero once more. Kira is at home, also struggling to read The Dread Doctors. Luckily Scott isn’t around to stick his claws into her neck. Mrs. Yukimura tells her that if the language if confusing the fox in her, perhaps she should stop trying to understand it. Kira says what we’re thinking: “Huh?” Kira’s mom suggests trying to read the book backwards. We’re still thinking, “Huh?” but Kira seems to understand. Kira uses this approach and eventually the horrible memories flood back. During the traffic jam on Route 115 (aha! ), back in “Creatures of the Night,” the Dread Doctors came for her. They experimented on her right there on the car, as her parents sat inside completely unaware. Either the doctors are hallucinations that create physical manifestations or they’re slightly out of phase with normal time and space. Mrs. McCall has given the Sheriff a real police statement regarding the dead chimera in her kitchen, with the truth and stuff. He doesn’t like it. Sure he wants to follow the law, but that doesn’t mean he wants to break the rules of supernatural secret club. Their tiff is interrupted by Deputy Hayden’s Sister, who apparently has no idea that her sister is missing. She tells the Sheriff that the night they received a prank call from the school library, Theo and Stiles’s key cards were used. He says he’ll take care of it and they’ll be no more bending the rules for anyone. We suspect he’ll come to regret that policy. The Sheriff and his team head to the hospital morgue to guard the latest chimera corpse. Stiles meets his dad there, warning him to leave the body, but the Sheriff is stubborn. Sheriff Stilinski asks his son about his library key card. Stiles acts guilty and lies to his dad, saying he lost his key card a couple weeks ago. His dad doesn’t seem to be buying his story. 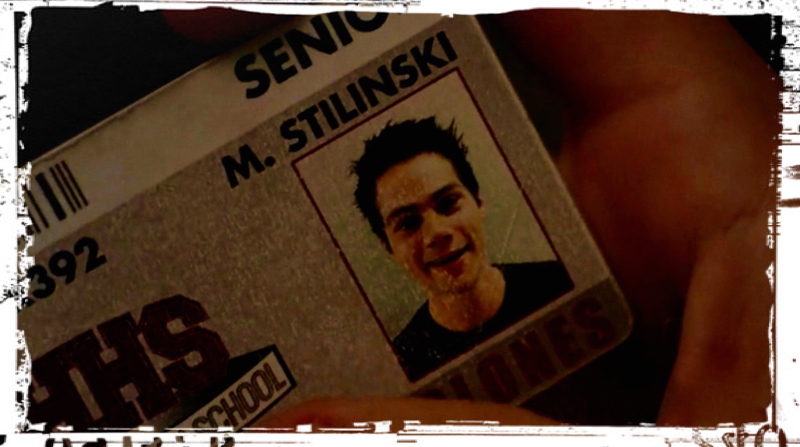 Later Stiles throws his card in the trash at the hospital, where it just waits to be found by his dad. MTV gives us the hashtag #MStilinski for this moment, reminding us that we don’t know what Stiles’ actual first name is. 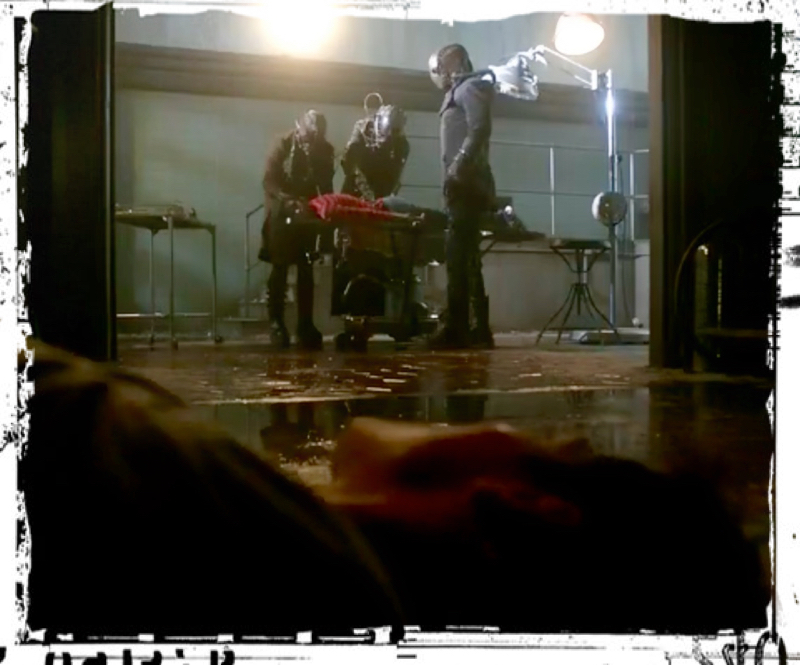 Sheriff Stilinski and his deputies arrive at the morgue with their big guns to protect the body of the dead chimera. Deputy Parrish stands inside the morgue alongside the body, while Stilinski and his other deputies guard the hallways outside the morgue. Stilinski has unwittingly helped Parrish to fulfill both his job expectations– as a sheriff’s deputy and a supernatural body disposal worker–at the same time. The basements starts to heat up and the sprinklers go off with hot steam, allowing Deputy Parrish to disarm his co-workers and remove the body, and then reappear clothed, robotic, and ash-free in record time. Despite this, the Sheriff looks at him suspiciously when Parrish tells him he thinks he saw the suspect (was he looking in a mirror?). 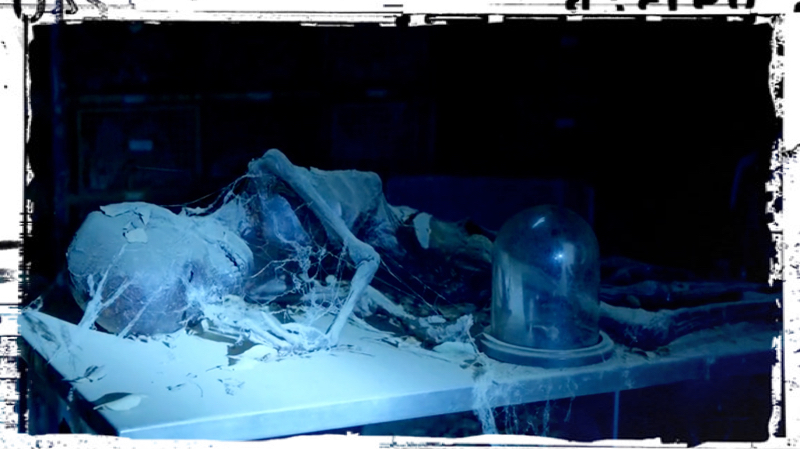 Sheriff Stilinski can only stand with his mouth agape when he finds the body has disappeared. What did he think was going to happen when all those sprinklers went off? Scott. Malia, and Mason have arrived at the water treatment plant and start making as much noise as possible. You know, just in case the Dread Doctors are nearby. Despite lots of running and yelling, Malia, Scott, and Mason still can’t find their friends. Scott has an asthma attack and Malia urges him to use his inhaler. What’s up with that? The return of Scott’s asthma despite his supernatural status still hasn’t been explained. Scott is ready to give up, but Mason gives offers a hand and tells him they have to keep looking. We’re kind of loving Mason. In their renewed search they walk right past one of the Dread Doctors’ gang signs – an ouroboros. Back at the clinic jailhouse, the Dread Doctors have taken away the stumpy winged chimera Zach, who was apparently another failed experiment. Thank goodness because he was creeping us out. When they hear noises, Hayden and Liam prepare for the Dread Doctor’s return by standing up and holding hands. Turns out not to be the Dread Doctors, but instead the Docs’ close personal friend Theo, who is playing the role of lone hero and rescuer. Despite an initial electrical shock, he managers to pull open the doors and free Liam and Hayden. Hmmm… wonder if he had any help? Liam and Hayden have a #Layden moment in the back of Theo’s car. Liam kisses Hayden, and it manages to heal her. Chalk one up for the beta! Creepy Theo, who sits by himself in the front seat, watches them in his rearview mirror. Scott, Malia, and Mason return to the house where Lydia, Theo, Liam, and Hayden await them. There’s a lot of slow-motion hugging and emotional music, leaving us unsure exactly how we’re supposed to feel about Theo. We think we’re supposed to hate him, but the show cues give us a mixed message. It looks like Theo is officially part of the pack, though it appears that Scott might be starting to piece some things together. The End. Oh, we almost forgot all about Kira and her disturbing recovered memories. It turns out that Kira and her family are leaving Beacon Hills. 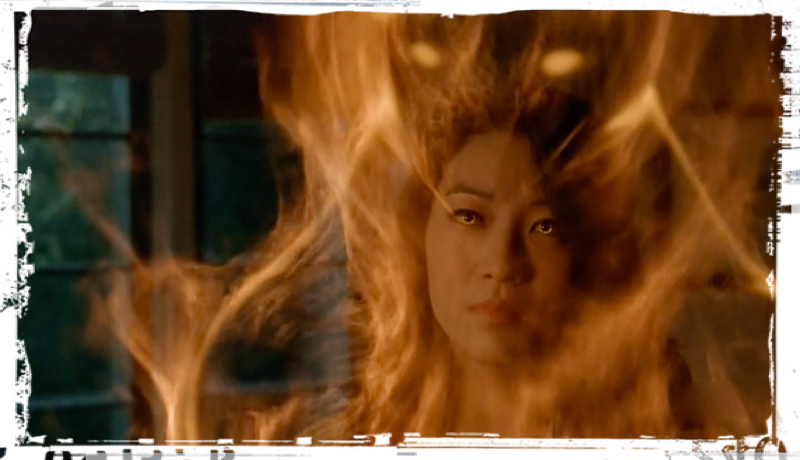 Now that she know the Dread Doctors have done something to her she needs to get her kitsune spirit under control, and Beacon Hills isn’t the place for that. Wow, getting their daughter far away from the Dread Doctors seems like the best parenting decision we’ve ever seen on Teen Wolf. Scott doesn’t want her to leave, but Kira’s afraid of the powerful fox spirit growing inside her, and let’s face it, so is Scott. She asks him to look at her with his other eyes and he sees the fox spirit, ever present. They say a sad good-bye in the pouring rain as electricity sparks around them, while Teen Wolf gives Arden Cho’s departure a lame #PeaceOutKira. Let’s hope she comes back soon because are sure going to miss her glowing kitsune fox spirit. It’s been the best special effect in Season 5 of Teen Wolf. Such a sad way to end the episode. Ok. We won’t lie. We thought that last scene really was the end, but it turns out we haven’t talked about Deputy Parrish enough. 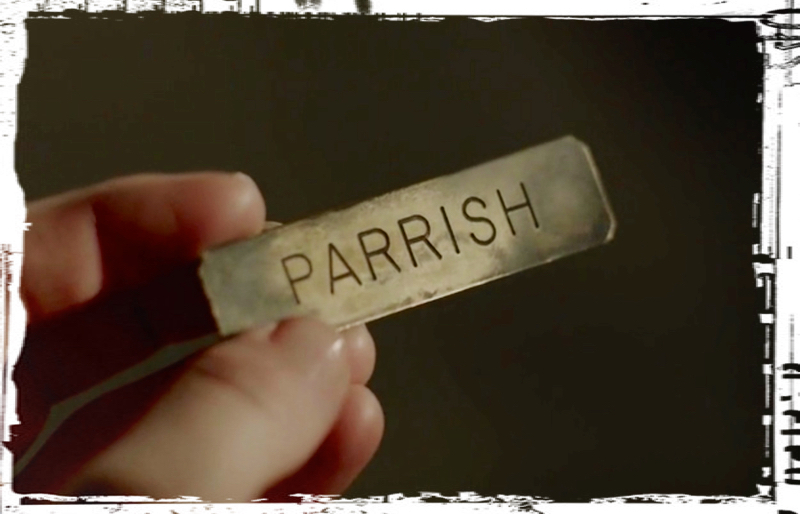 Stiles has found Parrish’s burned badge at the hospital, and shows it to Lydia. Lydia knows exactly where Parrish is taking the bodies–to the Nemeton. “Ouroboros” finally ends where it started–in Russia, where the Desert Wolf holds Dr. Deaton captive. We finally find out a little more about what she wants. It’s not clear where the Desert Wolf learned her parenting skills, but we suspect it wasn’t from Dr. Spock. Teen Wolf seems to be preparing us for a big mid-season finale through “Ouroboros.” The rescue theme of “Ouroboros” made for an exciting episode. Liam (Dylan Sprayberry) and Mason (Khylin Rhambo) have grown on us, but the jury is still out on Hayden (Victoria Moroles). Seeing Sheriff Stilinski (Linden Ashby) at odds with Melissa McCall (Melissa Ponzio) and the Yukimuras (Tamlyn Tomita and Tom Choi), as well as Dr. Deaton’s (Seth Gilliam) introduction to the Desert Wolf (Marisol Nichols) provided some interesting complexity to the role of parents and other adults in this supernatural teen world. Lydia now not only has to figure out what Deputy Parrish (Ryan Kelley) is, but whether he’s a good monster or a bad monster. We hope he’ll be one of the good guys, and can’t wait to find out who he is and what he is doing. He probably wants to know too. 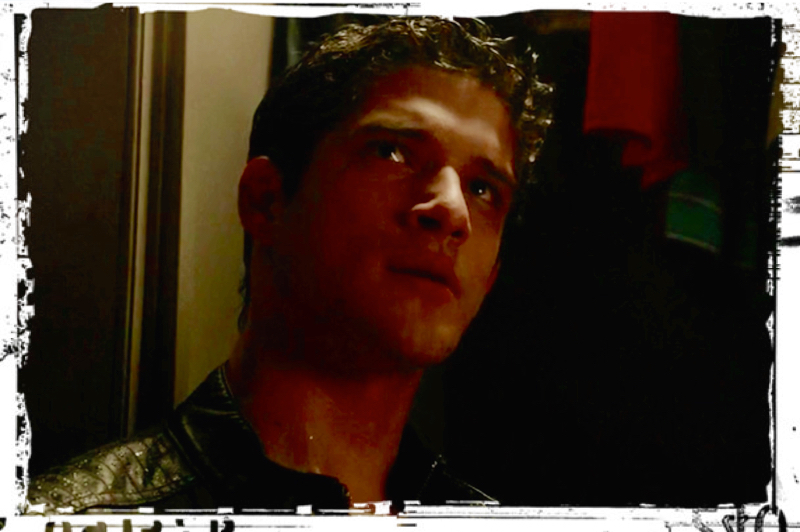 We can’t take too many more episodes with Theo having everyone fooled, so let’s hope Scott figures things out soon. We started Season 5 with the theme of change as Scott (Tyler Posey), Stiles (Dylan O’Brien), Lydia (Holland Roden) and Malia (Shelley Hennig) prepare for senior year. The question of what happens after senior year hangs heavy in the air, as graduation naturally brings change. Yet change comes to the pack earlier than anticipated with the arrival of manipulative Theo (Cody Christian) and the terrifying Dread Doctors (Marti Matulis, Douglas Tait, and Caitlin Dechelle). 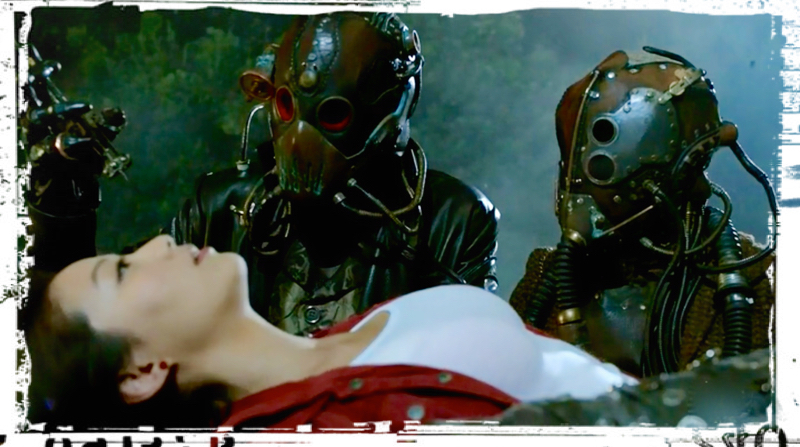 “Ouroboros” brings us a very surprising change, with Kira (Arden Cho) leaving Beacon Hills. While Theo’s status amongst pack members grows, “Ouroboros” shows us an alpha who can’t save his pack, let alone manage the asthma he’s no longer supposed to suffer from. With two more weeks until The Teen Wolf Season 5 mid-season finale, we are looking forward to some answers, or at least more clarity about the questions.